Summer is almost over and Christmas is just around the corner! If you have that special someone in your life who loves any type of tactical accessory, you’ve come to the right place. Tactical stockings have become very popular and are a great gift for any tactical enthusiast. From numerous zippers, military straps and hidden pockets to quick release toe clips, tactical stockings are well-constructed and very convenient. By comparison, a tactical stocking is just like a tactical bag — only smaller. 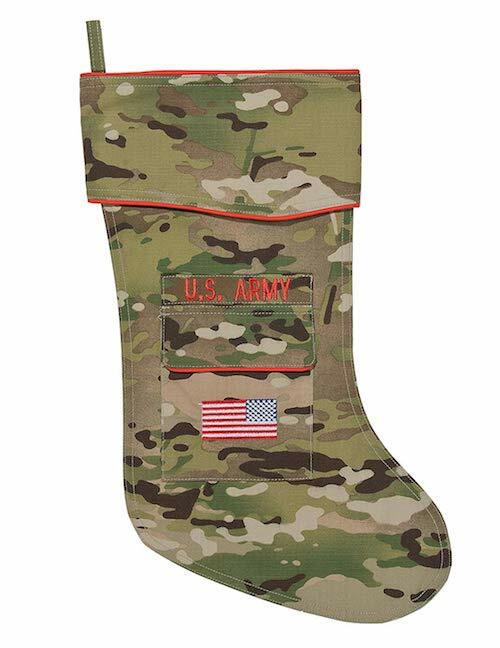 Additionally, these stockings are perfect for gift-giving at the holidays — you can stuff them with any and all tactical gadgets. Most tactical stockings fit an entire everyday carry, so you’ll have space to spare when filling it up with gear. They’re also equipped with even more pockets and zippers and you can attach them, thanks to MOLLE straps (which quite a few stockings offer). Velcro hooks and loops also let you customize with items such as name or flag patches. In addition to the above great features, tactical stockings are also very affordable. The Garud tactical stocking is chock full of pockets, straps, and clips. 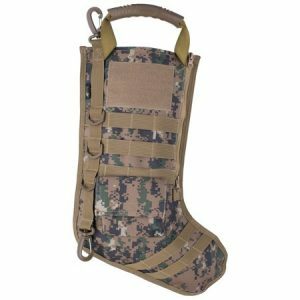 This MOLLE tactical stocking is a great alternative to a bright red stocking you may have hung on the fireplace mantle as a child. It also features an extra strong carrying handle — perfect for Christmas gifts! And, due to its MOLLE straps, you can expand its capacity with additional pouches and compartments. In fact, this is probably the best feature of this stocking — you can fill it to the brim! Two-way dual YKK zippers, UTX pull tabs and Duraflex UTX buckles. Check Amazon for the best price! RuckUp Tactical Stockings are perfect for the early holiday shopper. Contains MOLLE Straps for gifting accessories and extremely lightweight with strong hanging handle. In addition, the front side includes a zippered opening, pouch and Velcro attachment. Celebrate the holidays in tactical style with RuckUp’s smart and tactical stockings. If you’re a die-hard tactical enthusiast, look no further. 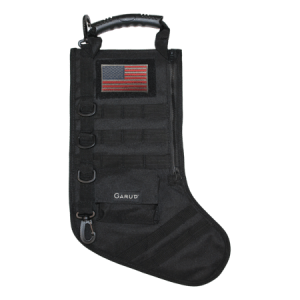 The RuckUp tactical stocking features a heavy duty carry handle, durable nylon construction, two rotating clip hangers. In addition, a hook and loop are just right for favorite patches — and MOLLE webbing, zippered side, plus a pouch with closure, d-rings, and swivel carabiners are also included. The RuckUp has it all! The Camosock Military tactical stocking features a gorgeous American flag. It’s made of cotton and nylon and incredibly well-tailored. The Camosock is unique and beautiful — the perfect gift for the tactical member(s) in your family! LA Police Gear brings you another item to their tactical line-up. Their tactical stocking is not another camouflage accessory — it’s a solid brown color and made of extremely durable material. Most importantly, if you’re not a fan of traditional holiday trim, the LA Police Gear Tactical Vest Stocking is the one for you. With multiple pockets and adjustable straps, you can definitely fit everything you need — and more! MOLLE gear allows you to hang knives, scissors, pens, etc. 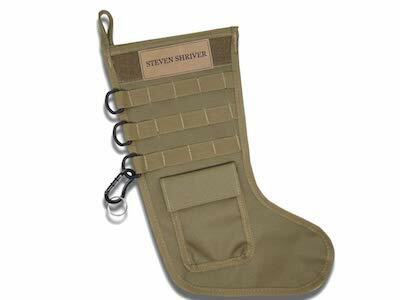 The tactical stocking by LazerDesigns is one that’s easily personalized. It’s great for gift bags at corporate events or Christmas gifts for a tactical friend or military person. This handy stocking is available in a variety of colors and textures — so there’s no need to worry about a number of options! The Osage River Ruck Up Canine Tactical Stocking is the right choice for someone who loves dogs more than anything! 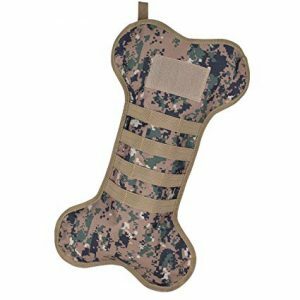 The Ruck Up Canine stocking is available in three colors and has fabric holders throughout. Feel free to hang candy canes, dog treats, and more! The Tactical Stocking by Survival Frog is the perfect stocking for a prepper or survivalist friend or family member who loves tactical survival gear. 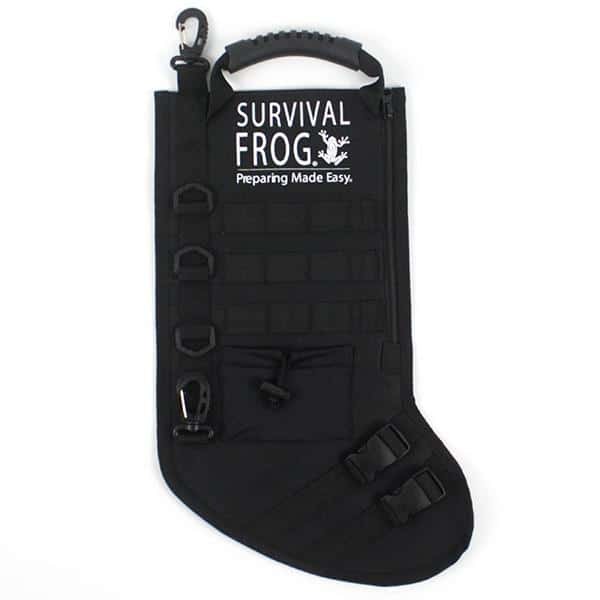 The Tactical Stocking by Survival Frog is tough and durable and fully capable of housing stocking stuffers. Moreover, this tactical stocking can hold all of your survival gear! The Tactical Stocking is one of the most popular survival gifts in Survival Frog’s online store, as it’s an extremely useful gift for any military/survivalist/tactical enthusiast in your family. Made of tough denier nylon — this is a smart present for those who enjoy all things tactical. Moreover, this tactical accessory is easy to use, with tons of places to store survival products, it’s also complete with rugged easy-slide zippers, daisy chain attachments, a comfortable carrying handle, rotating clip hangers, and woven nylon loops. 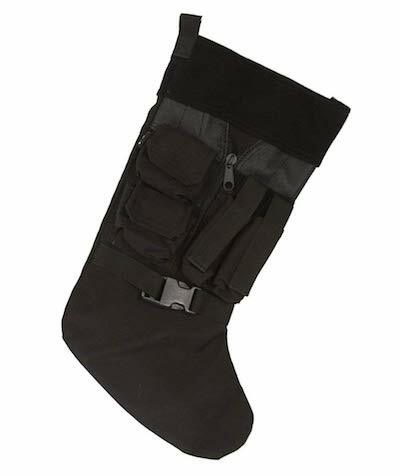 This tactical stocking is a survival tool and a great tactical gift. It’s also a great addition to any bug out bag or survival kit after the holidays are over. It’s fully capable of being filled with a wide variety of survival supplies — just absolutely perfect for the tactical enthusiast! We all have that one person who has everything. Tactical stockings just may be that one gift they don’t own. Tactical stockings are refreshingly different, fun and simply great for tactical equipment collectors. Moreover, tactical stockings are unique gifts and tactical enthusiasts love them. Instead of giving the traditional Christmas presents, choose tactical stockings. With everything from military straps to various secret pockets to bi-directional zippers and quick-release toe clips, tactical stockings have it all. The holidays can be stressful for some folks. But if you invest in a tactical stocking, you’ll look like a professional gift-giver! Good luck and happy shopping!